If you haven't seen City Hall lately, you haven't seen City Hall. Reopened in 1999 after a $300 million renovation, this beaux arts wonder designed by Arthur Brown Jr. (who also designed Coit Tower) is second only to the U.S. Capitol building in stature of municipal buildings. Built from 1912-1915, the building was the pride of then Mayor "Sunny Jim" Rolph who is memorialized by a dedication under the dome. Highlights include stunning light courts, the great staircase, an onsite museum, and a magnificent meeting chamber for the Board of Supervisors. 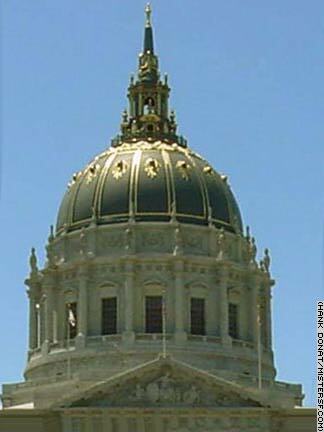 City Hall Dome, Architectural Model by Don Potts, 1982.